The day before her twenty-sixth birthday, Amy’s drug addict sister pulls a knife on her in a San Francisco church. Rattled by the traumatic experience, Amy retreats to her mother’s house in Marin with her childhood best friend, Cassidy. When Amy wakes up the next morning, it’s the day of her thirteenth birthday and the first day of seventh grade. Amy runs away in a panicked state but eventually accepts that she’s not dreaming; she really has travelled back to her thirteen-year-old self. Now she needs to figure out why this has happened, what it has to do with the strange symbol she sees everywhere, and how she can return to the present in 2016. 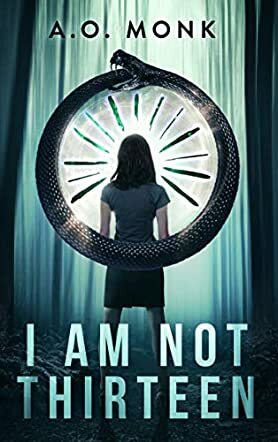 I Am Not Thirteen is an engrossing, atmospheric time travel thriller from debut author, A.O. Monk. Monk’s use of symbology is excellent and adds to the atmospheric tension of this novel as a family mystery and the peculiar beliefs of the Doomsday Garden cult arise in Amy’s search for a way to return to the present. I Am Not Thirteen poses a unique and intriguing time travel concept in relation to both the manner of the temporal shift and the consequences thereof. Amy’s intelligence and capacity to reason works well in the immersive first person POV, but certain details make her appear unreliable or uninformed on other matters. Complex family relationships, with Amy’s controlling mother in particular, layer with the overall intrigue of this novel as it becomes apparent that Amy isn’t the only person who’s travelled through time. Convincing characters and a compelling take on time travel make for an addictive read.